The video below shows small electronic side cutters being used to strip the insulation from the wires of a battery clip. When cutting component leads and wire, be careful as the piece of off-cut lead or wire can shoot off rather fast and may injure you or someone else. Point the piece of lead being cut away from yourself and others. To ensure that you do not get a piece of off-cut wire in your eye, wear safety glasses or goggles. When learning to strip insulation off wire using side cutters, you may want to practice on a piece of scrap wire first before attempting to strip the wire from a battery clip. If you make a few mistakes and accidentally clip the wire of your battery clip instead of removing the insulation, you will find your battery clip leads getting shorter and shorter. To strip the wire, carefully nick the insulation with the side cutter jaws, but do not cut through to the wire inside the insulation. After turning the wire so that the insulation is partly cut all around the wire, close the jaws only partly on the cut and pull the insulation off. Be careful not to cut the wire inside at any stage. The video shows that the wire end can be twisted so that it fits into the breadboard. Be aware that touching the bare wire ends or component leads can put oils from the finger tips onto the wire which may cause some corrosion of the wire after some time. Tools for stripping insulation from wire can be bought, but learning to strip insulation from wire using side cutters is a good skill to learn. 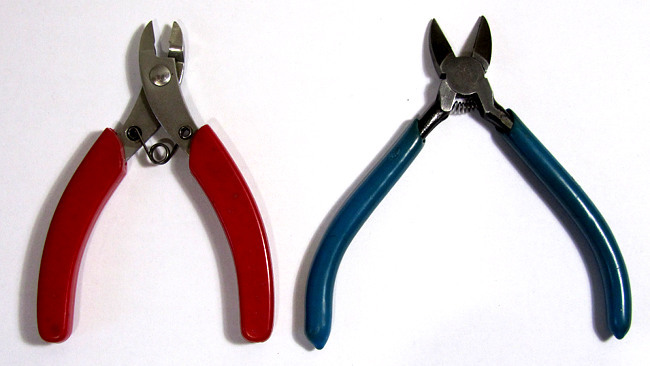 The image below shows more expensive stainless steel flush cut pliers and cheaper side cutters – both are designed for electronics work.